On October 18, 2018, Jack Mulder (Hope College) and Bertha Manninen (Arizona State University) had a refreshingly civil dialogue on abortion. After some humorous trouble with the microphones, the event gets going in earnest. Two friends, a pro-life philosopher and a pro-choice philosopher, came together to show us what civil dialogue looks like on one of our most contentious issues. Jack Mulder and Bertha Manninen had a refreshingly civil dialogue on abortion. Jack Mulder is the Chair of the Philosophy Department at Hope College and the co-founder of the Saint Benedict Institute. He writes and teaches in the areas of philosophy of religion, Catholic thought, applied ethics and the thought of Søren Kierkegaard. Bertha Manninen is an associate professor of Humanities, Arts and Cultural Studies at Arizona State University. Her scholarly interests are applied ethics, biomedical ethics, normative and meta-ethics, philosophy of religion, and social and political philosophy. 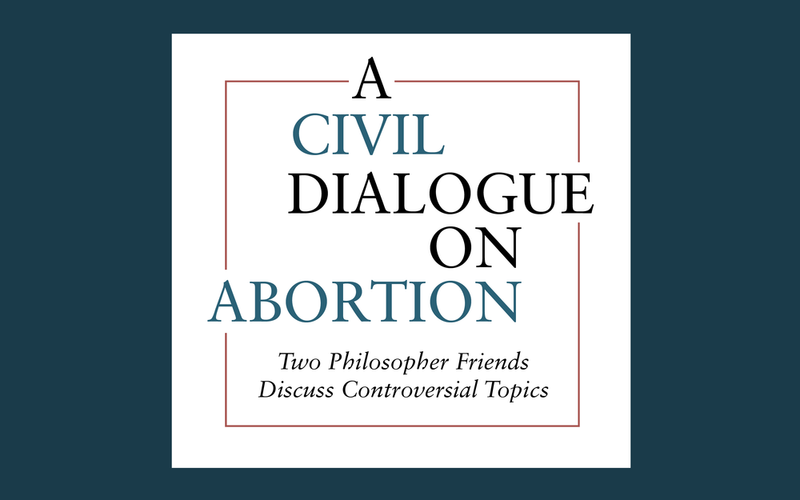 Their new co-authored book, Civil Dialogue on Abortion, (Routledge, 2018) has been praised by critics on both sides as showing us "how to engage with our opponents thoughtfully, critically, and respectfully while illuminating the moral and philosophical complexities behind the abortion debate." Jack and Bertha have been debating about this issue since their graduate school days. One might imagine that in the cramped quarters of a philosophy department office there are many debates. Over the years Jack and Bertha have debated over the philosophy of religion, ethics, and many other things. Jack said in all of these debates, “We clearly disagreed and we both clearly valued the truth.” Jack and Bertha were able to have a rich and meaningful debate on abortion because of this very principle. They both value the truth and understand that the other is seeking what is right. Although they may disagree, and they don’t disagree on everything, there is a general air of respect and admiration for the other person in their conversation. We can certainly learn many things from Jack and Bertha’s discussion. We see the complexity of the questions surrounding the abortion debate but even more clearly we can see how true friendship changes the dynamics of a controversial conversation, helping us to find points of consensus and perhaps understanding, with more clarity, where we disagree. This event was sponsored by the Saint Benedict Institute, the Philosophy, Political Science, Psychology, Religion, Women’s and Gender Studies Departments, along with Vox Populi, GRACES, Campus Ministries, the Center for Ministry Studies, Markets & Morality, and Hope Catholics.